Heracles and Athena. Source pic: Wikipedia. 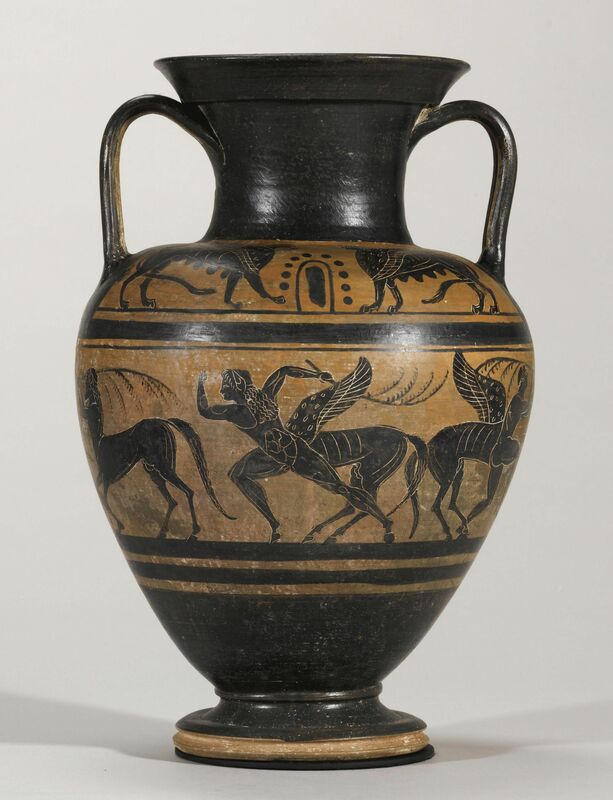 For example, has ancient Greek vase painting challenged any traditional view in mythology? Cleared any misconception, settled any debate? Have modern studies found anything in ancient pottery art besides confirmation of ancient mythographers? As far as I can tell, by and large, what this art-form's contribution has been is pretty much just the addition to the mythology of a handful of stories and personages unattested in literature, e.g. there are a few Gigantes who fight against the gods and whose names do not occur in any currently extant ancient mythography. These are Pancrates, Euphorbus, Euboeus and (what has to be the coolest name among the Giants) Uranium.✭ For the most part the trickiest thing about virtually every ancient Greek art-form (particularly sculpture and pottery) and its correlation to the written stories also has to do with the Gigantes, who, at least in comparison to the gods and to humans, do not seem to have been gigantic at all! 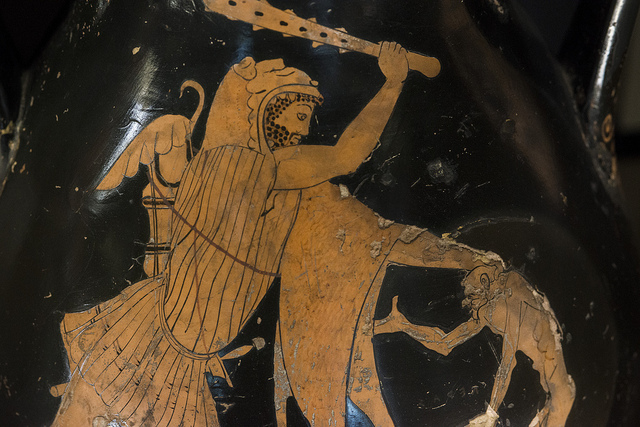 The vases depicting Heracles' fight with the Libyan giant Antaeus generally have the two wrestling opponents at the same size. The same goes for the Gigantes who attack the town of the Olympians in what comes to be known as the Gigantomachy: they are the same sizes as their enemies, with the exception of Alcyoneus, who is usually huge in comparison to those who contend with him. The Cyclops Polyphemus is also usually about twice the size of Odysseus. Perhaps the easiest way out of this conundrum is to conclude that the painters simply didn't have enough space in which to work for the sake of portraying these characters to scale. Otherwise one might have to say that the Gigantes (and also the Titans, who, on pottery, generally are also simply the same size as deities and human beings) only gained their great stature later in writing. Speaking of lost myths, it is most incredible to me that there might be missing stories, floating out there in the aether, about winged Centaurs! How could it be possible that such cool creatures don't receive a single mention in any major (or even minor) myth, especially considering how prominent Centaurs are during Heracles' lifetime? Well, this being yet more "lost mythology," I suppose these creatures may have appeared at any other random point in the chronology, far removed from the more famous characters. 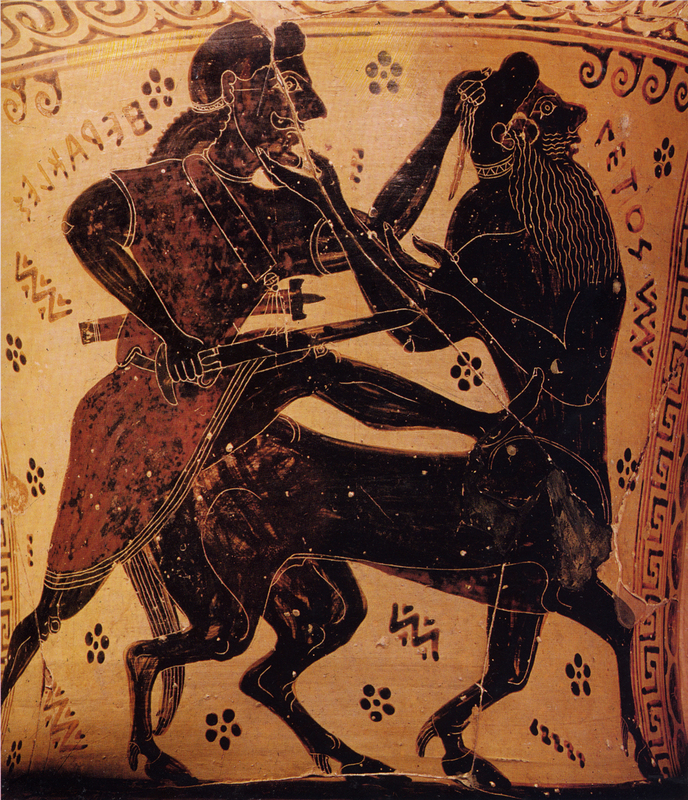 And speaking of Heracles and Centaurs, here (above) the Centaur Nessus appears being manhandled by Heracles. The Centaur's lower features distinctively seem to make him into, rather than the more mainstream Hippocentaur ("Horse-Centaur") variety of his kind, into a Bucentaur, a creature with the exact same configuration as an equine Centaur, except with the parts of a bull in place of those of a horse. ✭ Well, actually, in the original Greek Oranion or Ouranion ("Small Heaven"?). ✭✭ That image, though, depending on how you take it, perhaps frames Heracles in a really bad light, since he's really about to beat up on a little old man with his huge club. There's a Wikipedia category for these paintings: Achilles and Ajax playing. 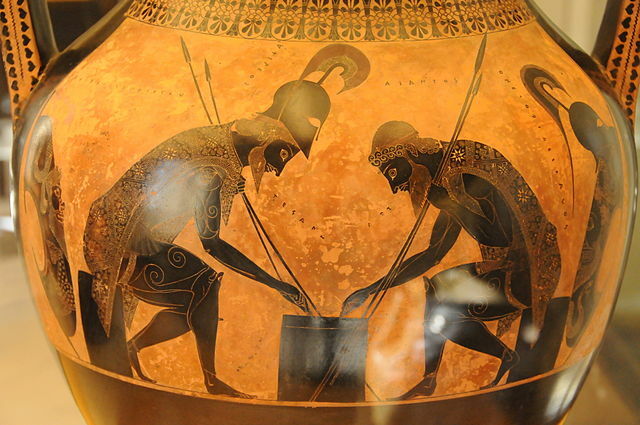 Achilles and Ajax playing a game, detail of an amphora by Exekias. Source: Wikipedia. Apart from the selection of this very intimate, seemingly relaxed scene as a symbol for the Trojan War, this vase-painting also showcases the talent of Exekias as an artist: the figures of both Achilles and Ajax are decorated with fine incised details, showing elaborate textile patterns and almost every hair in place. Interestingly, there is no extant literary source that is known to have circulated in the sixth century BC in Athens regarding a narrative involving Ajax and Achilles playing a board game. Exekias may have drawn his inspiration for this innovative composition from local oral bardic traditions regarding the Trojan War, which may have developed during his lifetime in the cultural context of sixth century Athens. More of an anecdote than a full answer, so I'm still interested in anything you can add. Not the answer you're looking for? Browse other questions tagged greek iconography or ask your own question. Did ancient Greek religion ever become monotheistic? How were Athena and Ares worshipped in relation to war? Who invented writing, or who taught writing to the mortals, according to Greek myths? 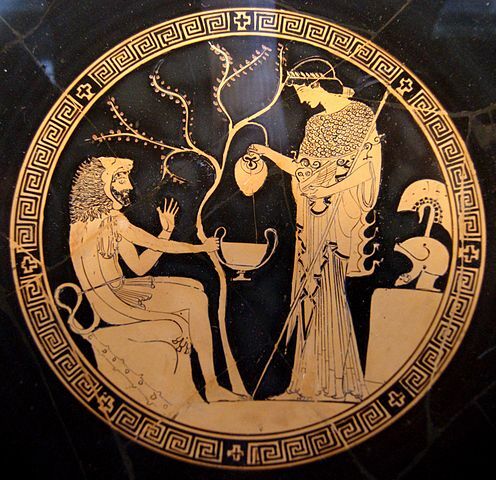 What treasure was made by famous mortal men, who we know by name, in Greek mythology? Where is the Ancient Greek belief of Pre-Existence referenced?